After working in different songbird projects in various parts of the world (British Columbia, Mexico, Australia, Wales), I decided to move to Nova Scotia to pursue my studies. I started my MSc with Dave Shutler at Acadia University, but then transferred to a PhD, co-supervised by Marty Leonard at Dalhousie University and Dave Shutler. Using various tracking devices (VHT tags, geolocators), my research focuses on the movements, at different scales, of a small seabird, the Leach’s storm-petrel (Oceanodroma leucorhoa). The ultimate goal is to be able to link those movements to the reproductive success. My field work takes place mainly on Bon Portage Island, at the southern tip of Nova Scotia, but also on Country Island and Eastern Shore Islands. When Leach’s storm-petrels are migrating, I also migrate and spend the winter in the French Alps. It is a perfect place to analyse data on snowy days and enjoy the scenery while cross-country skiing on sunny days! • Pollet, I. L., Hedd, A., Taylor, P. D., Montevecchi, W. A., Shutler, D. 2014. Migratory movements and wintering areas of Leach’s Storm-Petrels tracked using geolocators. Journal of Field Ornithology, 85: 321-328. • Pollet, I. L., Ronconi, R. A., Jonsen, I. D., Leonard, M. L., Taylor, P. D., and Shutler, D. 2014. Foraging movements of Leach’s storm-petrels Oceanodroma leucorhoa during incubation. Journal of Avian Biology 45: 305-314. • Pollet, I.L., M. B. Lancaster, H. L. Lightfoot, E. J. Vaasjo, and D. Shutler. 2014. 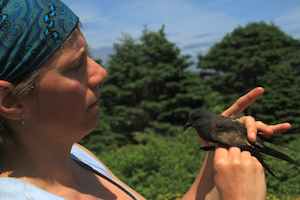 Fifty one degrees and 14 years of separation: a trans-Atlantic recapture of a banded Leach's storm-petrel. Wilson Journal of Ornithology. 126: 166-169. • Morrissey, C. A., Pollet, I. L., Ormerod, S. J., and Elliott, J. E. 2012. American dippers indicate contaminant biotransport by Pacific salmon in river ecosystems. Environ. Sci. Technol. 46: 1153-1162. • Miño, C. I., Pollet, I. L., Bishop, C. A., and Russello, M. A. 2011. Genetic mating system and population history of the endangered Western Yellow-breasted Chat (Icteria virens auricollis) in British Columbia, Canada. Can. J. Zool. 89: 881-891.